I don't know any history teacher that does not enjoy covering Civil War history. Although extremely devastating and tragic on so many levels, this unit shows young adults just how lessons can be learned from studying the past. Never before has the saying, divided we fall, united we stand, had so much relevancy than during the study of the American Civil War. Historian Page Smith wrote, "The Civil War took place because the southern states felt that they could no longer tolerate their status as members of the Union." The American Civil War was the bloodiest war in the western world in the 1800s. When it was finally all over, African Americans gained their freedom, while the federal government became a strong force in citizens' lives. It is important for students to understand that when the war began, Northerners believed the war would be over quickly. It wouldn't be long before they realize how wrong they were. What follows is four long years of bloodshed and destruction as well as some hard lessons learned on both sides of the conflict. There are obviously countless films and books on the subject of the American Civil War. My favorites include Gettysburg starring Jeff Daniels, which details the fateful battle of Gettysburg. Another favorite is Glory starring Denzel Washington and Matthew Broderick. This film chronicles the first Afrcan American regiment to fight in the Civil War or any American war for that matter. An excellent book to enhance the study of this unit is Uncle Tom's Cabin by Harriet Beecher Stowe. Another fantastic book that shows the human suffering endured during the civil war is Widow of the South by Robert Hicks. Find lesson packets for these and many more films and books at our Teach with Movies and Teach with Literature pages. A list of key terms related to this unit that will get your students acquainted with the American Civil War History. A PowerPoint presentation on the American Civil War with 61 slides. A complete set of Fill-in-the-Notes for your students. Debates are an excellent classroom activity! They teach students vital research skills as well as the art of debating and arguing effectively and constructively with their peers. Trust me, this is a skill everyone should learn! This handout details the procedures and guidelines for the debate activity above. An important handout that includes a planning guide, debate rules, and advie on effective debating. This project is so much fun; I have always had fantastic results when I've assigned it. Students use lots of creativity to construct Civil War dioramas. A rubric to help you grade the project above and to let students know how their projects will be graded. This chart assignment prompts students to research and learn about the numerous military leaders of the American Civil War. 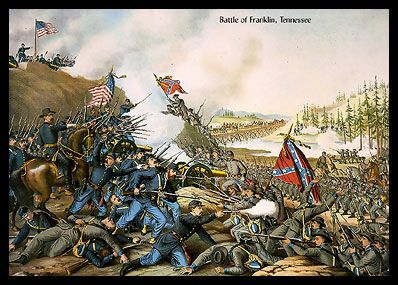 A study guide to prepare students for the test on Civil War History; I always make mine a mandatory assignment. This test includes an assortment of key term matching, multiple choice, and information recall with short answer questions and essay questions.